The Highlands Ranch Farmer's Market is held every Sunday from 10am - 2pm at Town Center South until October 28th. I'm glad that we get the chance to meet and support our local farmers! It's also a fun place for kids, they have different activities and booths throughout the year. 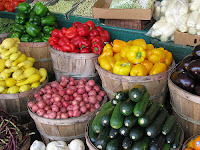 For more information check out the Denver Farmer's Market website. Belly Up Spa - Now Open! After months of anticipation Belly Up Spa is now open! They are located at 7600 East Park Meadows Drive in Lone Tree. This Spa was created for Moms :) They will offer Massage, Facials, Yoga, 3D ultrasounds and much much more! Also for all of you Rosie Pope fans - Belly Up Spa is the exclusive carrier of her clothing line in Colorado. If you mention you heard about them from Highlands Ranch Mom - you will receive a complimentary express manicure (not to be used with any other offers or coupons). Enjoy! The Taste of Highlands Ranch is this Friday, May 4th from 6-9pm at Eastridge. This event is a lot of fun and it gives you a chance to try samples from many of our local restaurants. Tickets are $25 per person in advance, and $30 at the door. Attendees must be 21, and be sure to bring your ID. There will be a silent auction with plenty of exciting items to bid on. All proceeds benefit the American Cancer Society, Relay for Life. See you there!